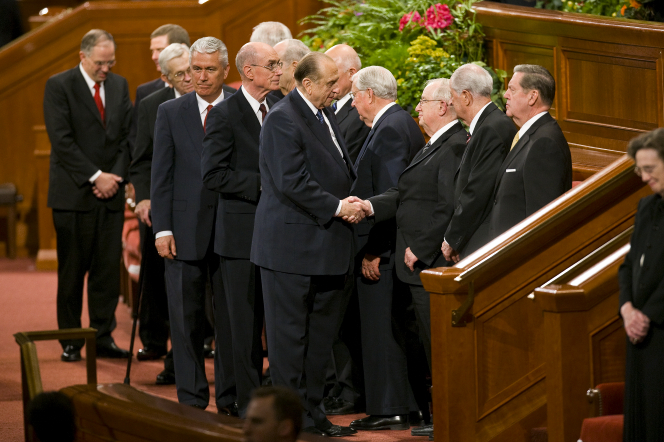 One of the Savior’s hallmarks is his trust in his prophets. From the first days of his public life he expounded his Father’s doctrine from the scriptures in the temple at Jerusalem (Luke 2:46-47; also Gerald Lund, Jesus Christ: Key to the Plan of Salvation, 51-52). When the adversary came tempting him, the Lord simply and firmly quenched every fiery dart hurled at him by responding, “it is written…” (Matthew 4:3-11). At the close of his ministry in Palestine the resurrected Jesus appeared to his disciples and declared “all things must be fulfilled, which were written in the law of Moses, and in the prophets, and in the psalms, concerning me” (Luke 24:44). Even in the dark aftermath of his mortal death Jesus declared that the destructions he unleashed were because the wicked cast out or killed his prophets (3 Nephi 9:5-11). During his subsequent personal ministry among these American sheep’ he quoted the entire chapter of Isaiah 54 (3 Nephi 22)-charging them to “search these things. Yea, a commandment I give unto you that ye search these things diligently; for great are the words of Isaiah” (3 Nephi 23:1). Jesus explained two reasons why Isaiah’s words were so great. “All things that he spake have been and shall be, even according to the words which he spake” (23:3; emphasis added). “He spake as touching all things concerning my people which are of the house of Israel” (23:2; emphasis added). The Lord declared that Isaiah is profitable for prophecy, meaning that his words will all be fulfilled. Additionally, his words can encompass the experiences of our personal spiritual lives as well as our collective Israelite/gentile future. It is our wonderful privilege to study Isaiah’s words today aided by the Book of Mormon’s commentary on the same. In the words of one Apostle, “no one, absolutely no one, in this age and dispensation has or does or can understand the writings of Isaiah until he first learns and believes what God has revealed by the mouths of his Nephite witnesses” (Bruce R. McConkie, “Ten Keys to Understanding Isaiah,” Ensign, Oct. 1973, 81). Undoubtedly there are yet understandings that await us if we will but “search the prophets” (23:5). An emphasis on writing appears throughout these chapters (22:1; 23:6, 11-14; 24:1, 16; 25:4; 26:6-8, 11-12, 16, 18). These passages together reveal a connection between the Lord’s expounding and our writing/studying what has been written. After quoting Isaiah 54, which the Nephites would have had on the Brass Plates, Jesus commissioned Nephi to “write the things which I have told you” (3 Nephi 23:4). This stands as a second witness to Isaiah, but also, at that time, functioned as a vehicle for them to receive the Lord’s further explanation (23:6). An interesting moment followed when Jesus carefully examined the Nephite scriptural record, noting what was to him a significant omission. Apparently the actual fulfillment of Samuel the Lamanite’s prophesy concerning the resurrection of many saints at the time of Jesus’ resurrection was left out. Jesus asked the disciples present “was it not so?” and they answered in the affirmative (23:9-10). Then the Savior “commanded that it should be written” (23:13). Directly following this he “expounded all scriptures in one.” Of interest also is the responsibility he placed on them to “teach the things which he had expounded” (23:14). A pattern may be discerned. First, we must write or study the words of the prophets. Second, we will then receive and should record the Lord’s explanation of the scriptures; as individuals in journals or other mediums, and as a Church through the official publications. Third, teach that which the Lord will direct according to the faith of the audience (Alma 12:9-11; 3 Nephi 26:8-12). These American Israelites show that when this pattern is repeated the experiences can become so great as to be unspeakable. 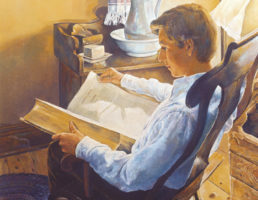 Those present during these awe-inspiring days with the Savior experienced the ultimate “expounding.” After they had received the Lord’s recitation of Isaiah and Malachi and the correction to their own record, the Lord expanded on “all things, even from the beginning until the time that he should come in his glory” and they recorded that on the plates of Nephi (26:6-7). Then came further revelations so “marvelous” that they were forbidden to write them! They had the precious experience of having their “babes” and “children” open their mouths and reveal things “even greater than he [Jesus] had revealed unto the people” (26:14). The prophet continued, “But this has been neglected, and now we cannot bear record to the Church and to the world, of the great and glorious manifestations which have been made to us with that degree of power and authority we otherwise could, if we now had these things to publish abroad…. Perhaps, for neglecting to write these things when God had revealed them, not esteeming them of sufficient worth, the Spirit may withdraw, and God may be angry; and there is, or was, a vast knowledge, of infinite importance, which is now lost” (Teachings of the Prophet Joseph Smith, 72-73). President Hinckley closed the October 2000 General Conference with this note on the positive effects of writing on individual gospel understanding and discipleship. “And perhaps, out of all we have heard, there may be a phrase or a paragraph that will stand out and possess our attention. If this occurs, I hope we will write it down and reflect on it until we savor the depth of its meaning and have made it a part of our own lives” (Sunday Afternoon session). I know that in my own life as I have taken the time and made the effort to record my thoughts, feelings, impressions, and questions that have been raised through scripture study and personal gospel reflection, the Lord has granted me further knowledge and understanding. I look forward to that “perfect day” when I will have developed the faith necessary to receive an answer to all things (cf. D&C 50:24). As noted above, the fulfillment of Samuel’s prophecy that many others were also resurrected with Christ’s had not been recorded. Why would this be significant enough for the Lord to correct it? As “Another Testament of Jesus Christ” the Book of Mormon was designed to witness in a latter-day world. In our day the accuracy of historical events recorded in the Bible is greatly under fire. One such biblical event that is greatly misunderstood and/or refuted is the resurrection. The existence, nature, and scope of Jesus’ triumphal rise from the dead are actually the subject of much modern scholarly debate. This was brought to my attention while I was attending a well-known graduate theological school several years ago. In a class on Christ, entitled Christology, the professor was asked a question about the resurrection. He became very animated as he explained that this was the subject of his doctoral dissertation in Germany. He said that the answer to the student’s question was complicated by the fact that there are various interpretations of the biblical account. He proceeded to draw a rectangle on the board representing the Bible and began to explain that this well-known scholar had his opinion based on these verses, while another theologian had her opinion founded on some other passages. He then humorously noted that he differed from their interpretations due to still other verses. All the while he was banging away with his chalk at the rectangle representing the Bible. I sat stunned. Here was a learned man, a student of the Bible, who recognized the inadequacy of that single record to teach accurately about the resurrection. Soon after this event I was reading in 3 Nephi 23 and was amazed at the significance of the Savior’s correction to the Book of Mormon record. I understood more fully why the inclusion of Samuel’s prophecy being fulfilled literally was so significant. The fact that “many saints” also arose, appeared, and ministered to the American Israelites testifies of the scope of Jesus’ rise from the dead (23:9, 11). The fact that he also ministered personally, “[showing] himself unto them oft” (26:13) is further witness that the Savior indeed rose from the dead and so will all; either “to the resurrection of everlasting life,” or “to the resurrection of damnation…according to the mercy, and the justice, and the holiness which is in Christ” (26:5). When our children were younger and we would be on our way to Sunday church meetings, occasionally we would pass a car pulling a boat. My children would become silent and press their noses against the windows and ask, “Dad, why can’t we go water-skiing today instead of to church?” Sometimes I would take the easy but cowardly way out and answer, “It’s simple; we don’t have a boat.” However, on my more conscientious days, I would muster up all the logic and spirituality available to a patriarch of a family and try to explain how much happier our family was because of our Church activity. I first realized I wasn’t getting through when on a subsequent Sunday we saw a family laughing and excited as they loaded their snow skis onto their car. One of my teenage sons said with a sly grin, “They’re not really happy, huh, Dad?” That statement has become a family joke whenever we see someone doing something we cannot do. When I see a teenager driving a beautiful, expensive sports car, I say to my sons, “Now there’s one miserable guy” (Ensign, Nov. 1987). Make us more able to “discern between the righteous and the wicked” (3 Nephi 4:16-18). This last blessing of being able to overcome the temptation to misunderstand the worldly misery for happiness is something that all of God’s children have been tempted with. King David experienced it and wrote about it in several of his Psalms (esp. Ps. 37, 73). For David a great help was to attend the temple. “For I was envious at the foolish, when I saw the prosperity of the wicked…. When I thought to know this, it was too painful for me; until I went into the sanctuary of God; then understood I their end…. So foolish was I, and ignorant…. Thou shalt guide me with thy counsel, and afterward receive me to glory” (Ps. 73:3, 16-17, 22, 24). Elder Pace powerfully adds his modern witness. 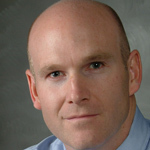 To those of you who are inching your way closer and closer to that great and spacious building, let me make it completely clear that the people in that building have absolutely nothing to offer except instant, short-term gratification inescapably connected to long-term sorrow and suffering. The commandments you observe were not given by a dispassionate God to prevent you from having fun, but by a loving Father in Heaven who wants you to be happy while you are living on this earth as well as in the hereafter (Ensign, Nov. 1987). I am grateful for such clear teaching in our often-murky modern day. Truly the prophets of the Lord-ancient and modern-provide the principles and patterns we need to “abide the day” of our Savior’s coming. As the Lord so thoroughly taught from his prophets, so may we profit from a continual searching of the same.